Change doesn’t happen by itself. Your donation helps us complete this meaningful project and create programs designed to inspire and empower girls. Thank you for your generosity! Pre-order a download of Girl, the album. It’s a collection of girlicious original pop songs created to inspire and energize girls! Your pre-order helps us fund the final touches on this project. Get our specially packaged Girl, the album on CD! The perfect gift for a girl in your life…Pre-order now and we’ll sign it and send it with love. 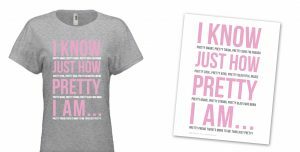 Get a cool, exclusive, beautifully-printed and signed 11×14 art print featuring the powerful chorus from “Pretty,” PLUS a download of Girl, the album. 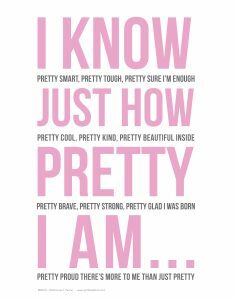 I KNOW JUST HOW PRETTY I AM… Pretty smart, pretty tough, pretty sure I’m enough. Pretty cool, pretty kind, pretty beautiful inside. Pretty brave, pretty strong, pretty glad I was born. Pretty proud there’s more to me than just pretty. This fantastic package includes a custom, beautifully-illustrated “Girl, the album” coloring book. 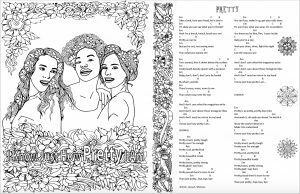 It’s chock full of original artwork, plus all of the lyrics and chords to every song so you can play along, The Girl Songbook also includes thoughtful activities that accompany these meaningful songs. 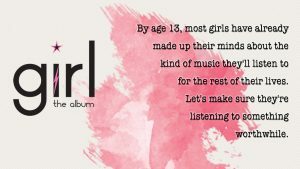 Of course, this also comes with a download of Girl, the album! The coolest T-Shirt ever! 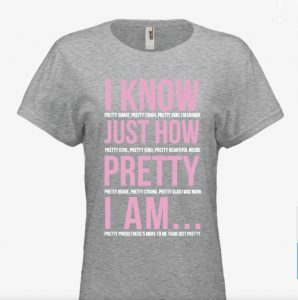 Featuring the chorus from ‘Pretty,’ this T-Shirt makes a bold statement – as seen in the photos of our project description. Choose your size of Women, Youth, or Men’s S, M, L, or XL. Want more than one T-shirt? Add another $20 for each and we’ll ship them together. The full works. Get all of the amazing custom Girl items and we’ll put a custom thank you note in the package too, signed to whomever you like. That special girl in your life will really feel…special! Plus if you want an additional T-shirt, just add $20 each, let us know your size (Women, Youth, or Men’s S, M, L, or XL) and we’ll ship them together. The perfect gift! Get the whole fantastic Magic Pack plus a bright and beautiful lipstick courtesy of M.A.C. Cosmetics, special hair care products from Paul Mitchell, and 2 packs of Martin strings so you sound pretty amazing, too. Love it! Note: hair care products may vary. Want more than one T-shirt? Add an additional $20 to your total for each one and send us your size requests. Jenna and Laura will record a personalized video “Sing Out” to you or the girl of your choosing. A super fun way to make a girl feel extra special. And, of course, we’ll include our amazing Girl Magic Pack, too!! You’re not going to believe your ears! 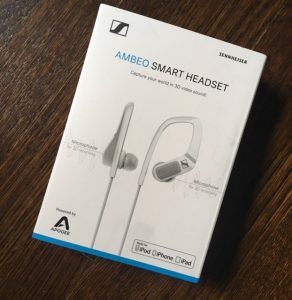 This headset boasts signature Sennheiser sound quality and smart features including Active Noise Cancelling and Transparent Hearing, but that’s just the beginning. Special microphones located in each earpiece allow you to capture stunning 3D sound to complement the videos you take with your iOS device. The result is a truly immersive audio experience that can be reproduced by any headphones. Wow!! Girl Magic Pack included. Valued at $375. What a deal! You, front and center at one of the most prestigious events celebrating women in music in the world. The 2019 She Rocks Awards takes place on January 25, 2019 at the House of Blues Anaheim in Anaheim, CA. You’ll get two amazing VIP seats, dinner, VIP gift bags and a chance to be part of history as top celebrities and women in the music industry take the stage. This event is produced by Laura B. Whitmore and her organization, the Women’s International Music Network. Find out more at thewimn.com. Travel not included, but the Girl Magic Pack is! Share the inspiration with this unforgettable live experience! 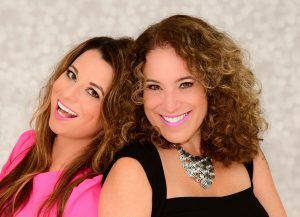 Laura B. Whitmore and Jenna Paone will present a private house or business concert and Q&A session or workshop in the NY or Boston area, subject to availability. Or, you can cover the travel for us to come anywhere. Potential for special guests depending on availability. Scheduling depends on availability. Of course, we’ll include the Girl Magic Pack. Let’s make some magic happen! Great for schools, after school programs, community fundraisers and so much more.